I have a bit of a head start on one of my new years goals. I’ve already started making a companion dress to the project I finished almost two years ago. It’s still in the very early stages yet and I tend not to sketch out what the finished object will be until later when I’m working out the details and finishing. Anyway, here’s a preview of what I’ve finished so far. 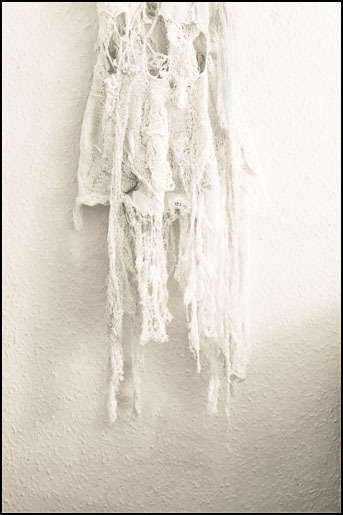 I’m looking for it to be as ghost-like and ephemeral as the original dress. I like the web-related projects to be both seen and seen through, there and not there, delicate, and above all, subtle. The hardest part, to me, is the finishing and displaying of the object. A painting, obviously needs a frame, but how do you display a dress that is meant to be seen from all sides? I’m very, very lucky to be friends with a super talented hand-spinner and I’m very lucky she likes me enough to give me some of her wool. My immediate reaction (and I’m sure most knitters would agree) is that I want to make something akin to a bean-bag chair of all the skeins and just collapse into its softness. I want to make some kind of shrine to admire (and squeeze) the skeins forever. Unfortunately, this isn’t practical. The other option is being too afraid to do anything with the wool and this seems like a massive shame to the beautiful yarn and hard work that was put into making it. 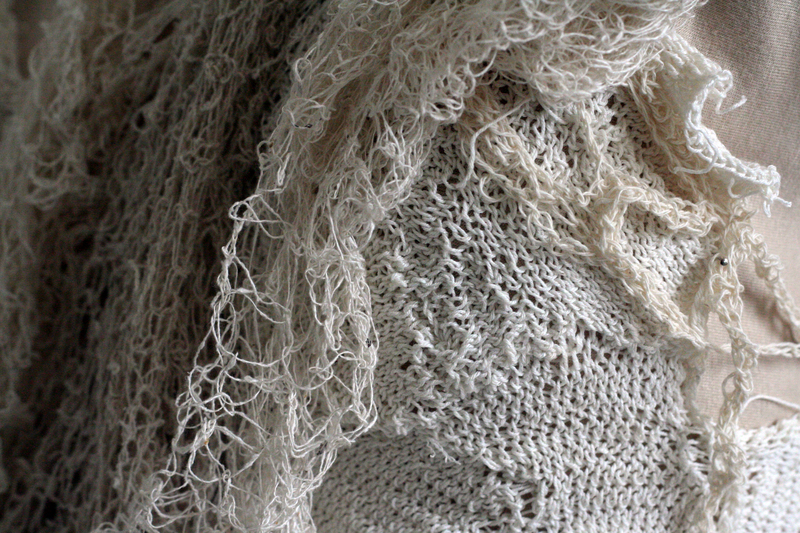 The second shawl is almost shawl-size and is also super cozy and warm. I used two colours of hand-spun wool (not sure what kind) and since the wool was two different thicknesses it made the stripes into two slightly different textures, which I quite like the imperfection of. The whole idea behind using this simple pattern is to let the natural shape and size of the wool shine through so it can be used for lengths that are of varying widths or of variegated colours. In case you’re curious, the pattern is very simple. Cast on 5 or 7 stitches in any way you like, marking the middle stitch with stitch markers. So cast on 2 (or 3) stitches, put a marker, cast on a stitch, and put a marker then cast on 2 (or 3) more stitches. For every row, knit up to the marker, yarn over, slip marker, knit the middle stitch, slip marker, yarn over and knit to end. Continue this pattern until you either run out of wool or reach your desired length. You can play around with the garter stich pattern by knitting one row and then purling a row then knitting a bunch of rows. You could also knit a row, purl a row, then knit 4 rows and repeat to make another pattern. This will had some more texture. Or instead of having the yarn overs in the middle, you can also put them at the sides of the shawl. Although, I really like how they’re in the middle in my shawls. It looks a bit like a back bone. As kind of a follow-up from the feminism articles, an announcement of a new project, and to share someone really awesome, in this post I will become a fanboy(girl) of Louise Bourgeois. I’m currently working with Stephanie Cotella Tanner of Art Smacked who is curating a show at some point in the future. Stephanie is being kind enough to include me in the show with some really awesome artists. I kind of want to describe them as ‘proper’ artists as they’re both formally trained in art and are really quite good! Anyway, Stephanie wants to compare my work to the historical precedent of Louis Bourgeois. Bourgeois is a French American sculptor and artist who worked with many materials and with many themes over her extraordinarily long career. 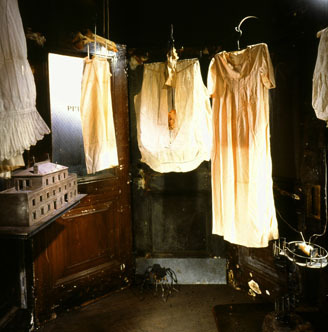 My main interest in her work is the textile pieces that deal with the ‘exercise of memory.’ She was the artist behind the giant spider object at the Tate Modern a few years ago. The description of her work, is basically what I’m trying to communicate through my art. I joke that I make art because its cheaper than therapy, but to some extent, it is a way of exploring the world, my experiences, and my memories.The idea of using something with history also appeals to me. The material, if reused from somewhere, sometime, else brings all of those memories to the new object, kind of like magic. I think also that what appeals to me about using string is the idea of taking a mess of string and organising it into an object. 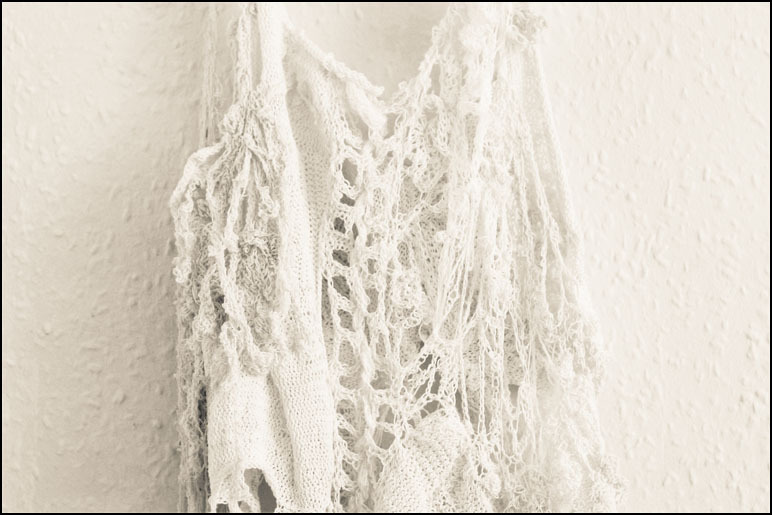 From personal anecdotal evidence, I’ve found that a lot of information professionals knit or crochet and I think that there is some kind of organisational aspect to working with string. I trained in information management, work at organising a database, and generally am a bit of a clean freak, so this aspect of working with string fits into my personality. The production method is also essential to my work. The fact that it’s awkward, hand made, and takes ages (in my case), makes it a meditation on whatever I’m trying to make sense of be it year’s worth of memory or of the entire city of London. By combining the memory of the materials used in the awkward production method that I use, the object is transformed into an organised memory. It is transformed into something that makes sense of all that it contains. I’m not entirely sure how this fits into my previous posts about art and feminism, but Bourgeois is incredible. I think I have a lot more to learn about Art History. Now if someone could teach this American how to pronounce her French last name, it’d be greatly appreciated. So in part 1 we established a quick and dirty history. It was a very quick history as this series is an unfinished musing of my own thoughts. I’ll continue to research and amend it and you could too, if you like. I think the 70’s are unfairly remembered as just the time when a bunch of communist hippies planted flowers, but the movements in the 70’s really opened art (and life) up to groups that were traditionally not directly involved or marginalised. 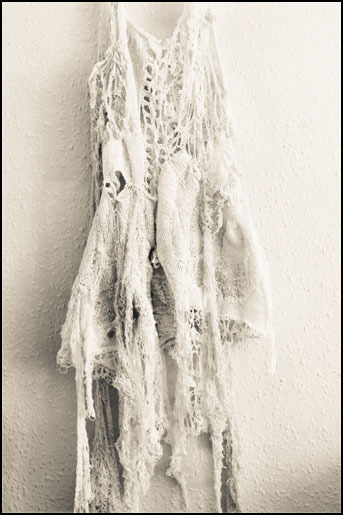 Macramé was the beginning of a lot of embarrassing fashion for my parents generation, but in art, it opened up new materials to be looked at in the context of fine art. Essentially, where was art meant to go after minimalism? Where do you go with traditional techniques once you’ve pared it down to it’s component parts? And what do you do with it when photography is accepted as the more ‘realistic’ technique. Obviously, some painters found their own direction and there are still some today that are moving in new directions with painting. Photographers, too, have moved beyond the basics of just capturing life as it happens. The addition of new techniques and materials, such as those textile-based crafts opened up a new area of exploration and a new arena for those groups that weren’t involved in art before. The inclusion of traditional ‘women’s work’ allows for the inclusion of more women in art. This is not to say that there were not female artists before this. They did exist. There were women impressionists (even a ceramist, thank you BBC) and Jackson Pollock’s wife was an established artist, to name a new. The modern art movement and it’s American post-war counterpart, American Expressionism movement, was still dominated by men, but the women in their lives were artists and played a huge role in the making of this art, if only for their infinite patience. However, there are some larger-than-life female characters in the modern art saga like Peggy Guggenheim. Eventually women were begun to be recognised as artists in their own right, with their own voices (without any token status). Some artists that come to mind are Frida Kahlo, Barbara Hepworth, and some textile art in the upper gallery of the Tate Modern by Marisa Merz. Marisa Merz, as part of the Arte Povera movement, explores a lot of the art and life, home, and femininity ideas that interest me as well. She includes craft and traditional ‘women’s work’ to explore these themes. The British Museum held a twitter debate on craft and it’s role now and some major themes of it were it’s traditional role, it’s social nature, and art vs. craft. Craft has the added value of traditionally and continually being a social arena. Traditionally a women’s ‘club’ to sit around together and talk and socialise, which has continued (with both genders) today. This is a very valuable contribution in a world (and a city) that can be very antisocial. The distinction between art and craft was also discussed especially in terms of maintaining that distinction as two different, but equal methods. So one will not devalue or change the nature of the other. However, for my work, I think that my craft doesn’t have to be just art or just craft. It can perform multiple roles both traditional, traditional female, and avant garde in the big, masculine? art world. It can be a social, fun expression of traditional techniques for both genders and a form of artistic expression for both genders. Since craft hasn’t found it’s place yet in it’s rediscovery, if you will, it is still malleable. It’s not defined. It can be whatever you or I want it to be, Art or craft, art or Craft, for both genders. So, it’s finished. All the millions of loose ends are tucked in, all the bits are added, washed and dried and ready to go. Or not. It looks like a skin that’d been shed, kind of like the snake skins you find behind bushes or caught on nails in attics. But can you ever really shed your skin? Metaphorically, of course. Can you leave it behind? and do you even want to? Is it a trap? or is it like your non-metaphorical skin, protecting you (from what)? Is it keeping you still or providing a foundation to move forward? Is it a construction you made out of fear of the outside world or in spite of it? Is it what you want? I’m sure many of you have seen the tutorials online on how to make a dress form out of various household materials and with varying levels of dedication to being covered in those materials. Well I sucked up my claustrophobia and bought a men’s t-shirt and some tape in the name of not spending 100 pounds on an industrial dress form. In case you haven’t seen it, here are the tutorials that I’m referencing and, in fact, used to make my personalised dress form. My friend Lenny from the RunnyCustard blog, came over to help wrap me in duct tape, amid many, many innuendos and a bit of accidental groping. (What’s a bit of groping between friends?) At first, I tried using packing tape which proved to be much too thin and provided little structural support. We then laid a layer of duct tape over the packing tape (as per the instructions) which worked like a charm. I then went to my local craft shop and bought some fabric to cover the form and viola! It looks and works like at least a 50 pound dress form! And an obligatory web dress shot!